Bottom-dweller in the Bay’s flats and channel margins. Visits the lower to middle Chesapeake Bay from spring through autumn, leaving the Bay in winter for deep offshore waters. More common in the lower Bay but travels as far north as Love Point on Kent Island. The northern puffer is a club-shaped fish that puffs up into a ball in self-defense. It visits the deep flats of the middle and lower Chesapeake Bay from spring through autumn. The northern puffer usually grows 8 to 10 inches in length. Its yellow, brown or olive body is covered in small prickles. It has a yellow or white belly and a tiny, beak-like mouth. Dark, vertical, splotchy bars appear on its sides and small, black spots appear on its back, sides and cheeks. 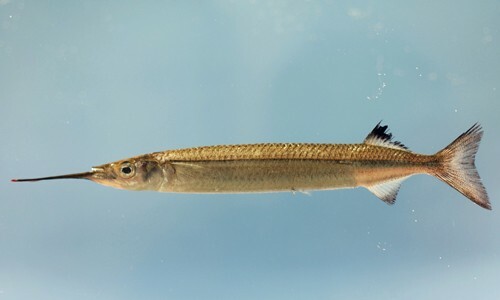 Its small dorsal fin is set far back, near its tail. Northern puffers uses their strong, beak-like mouths to crush the shells of small mollusks, crustaceans and other invertebrates. The puffer's ability to puff up into a prickly ball deters many predators. 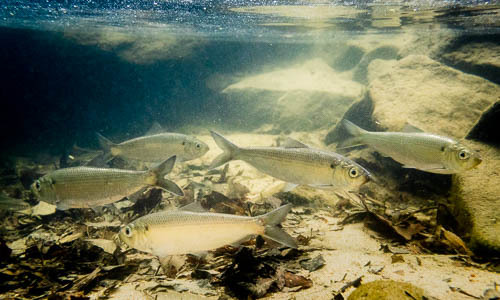 Spawning occurs from May-August in shallow waters near the shore. The female lays sticky eggs that attach to the bottom and the male guards the eggs until they hatch. Little else is known about the northern puffer's life cycle. Puffers puff up by inhaling air or water into a special chamber near the stomach. If caught and thrown back into the water while inflated, a northern puffer will float upside down at the surface for a few moments, then quickly deflate and swim away. 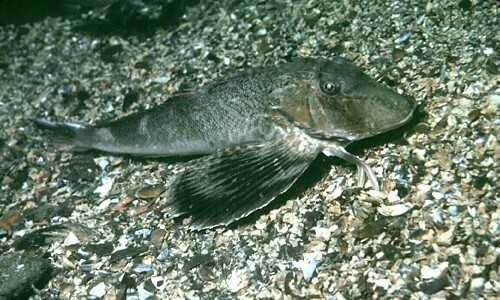 Although some types of puffers are poisonous, the northern puffer is not. In fact, it is a delicious fish, sold in fish markets as "sea squab." The northern puffer is not an efficient swimmer; it swims by moving its tail fin back and forth like a paddle to propel itself forward.